January was a month of trying lots of new products after receiving some fab things for Christmas and a few(!) sneaky purchases. I'm just going to get straight into letting you know what I love about these products. 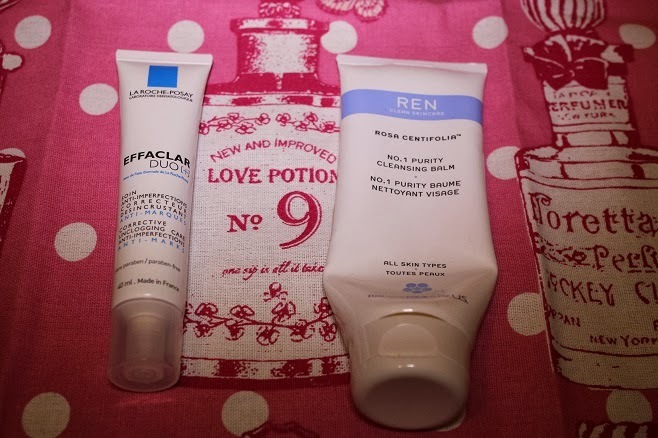 La Roche-Posay Effaclar Duo has long been a blogger favourite but one I'd put off buying as products targeted at spotty skin can be drying and that was the last thing I needed for my dehydrated skin. For some reason during an Escentual sale, I decided to follow the hype and ordered myself some of this wonder product, or so I thought. What arrived was the Effaclar Duo +, apparently with all the same benefits of the original one with the extra mark correcting feature. I always get red marks left from spots on my chin so when I saw this product would help with that too, I was very pleased! What I've found when using the product is that it's very easy to dispense with a fine nozzle at the end of the tube, it's a light lotion that doesn't feel heavy or sticky on the skin. It doesn't dry out the skin or turn it white and crusty (nice!). There is no stinging or any other unpleasant feeling. It just feels like you're applying a moisturiser to the skin. I use this on my chin only as I would rather use up some of my other products on the dehydrated areas since I've spent so much money on skincare lately. This has really helped with clearing spots up, stopping spots in their tracks and as I've got into February, I can now say that it's helping reduce the red marks too. I can't wait to see what results long term use of this will bring. With cleansing balms becoming very popular in the last year or so I decided to try the REN Rosa Centifolia No.1 Purity Cleansing Balm. I've found this to feel like a luxurious treat for the skin and the gentle rose aroma is very calming. I feel like it adds moisture to my skin as well as cleansing it and it doesn't leave my skin feeling tight after use. The muslin cloth that comes with this is rather tiny and doesn't cover my whole face which is slightly annoying but I have other cloths so it's not a big deal. Also this product stings my eyes so I can't use it for eye make up removal but I still love it for the reasons already mentioned! I'd never really thought about buying Bobbi Brown skincare before but the sales assistant who sold me some makeup twisted my arm (yeah right, I don't need my arm twisting to buy anything!) into buying this along with my other purchases. This light lotion is very soothing and cooling on the eye area and makes applying concealer very easy. It provides long lasting moisture too. I'm really liking this and I think it's one of the best eye creams I've ever used. My day and night serums ran out recently so I picked these to replace them. 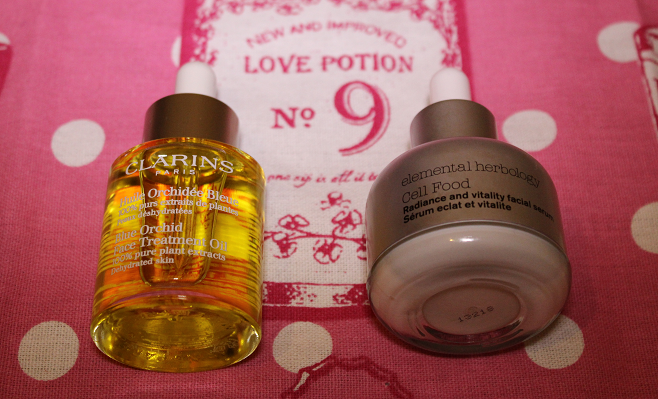 The Clarins Blue Orchid Face Treatment Oil is something I've had my eye on for a while. It's the first oil I've ever owned and it's really doing my skin some good. The oil has a pipette that allows you to dispense a tiny bit of product at a time, which is all that's needed for your whole face. It's easy to make your face too greasy if you use more than two drops of this! Even with two drops, I do feel a little greasy when I go to bed but this isn't uncomfortable and it sinks in overnight leaving really nourished and plumped up skin. I love it! I'd heard a few bloggers rave about the Elemental Herbology Cell Food serum so when I saw it massively reduced in the Boxing Day sales I couldn't resist buying it. It's a milky serum that I apply to my face in the morning before moisturiser and this is another very hydrating product. I tried applying my moisturiser without this first and I noticed a big difference. The combination of the oil and serum are leaving my skin hydrated all day and night. I requested a lot of NARS cosmetics for Christmas and I've been loving trying them out. The NARS Radiant Creamy Concealer has become a daily staple. It's amazing at covering redness and blemishes. The shade Chantilly is perfect for my pale skin too. 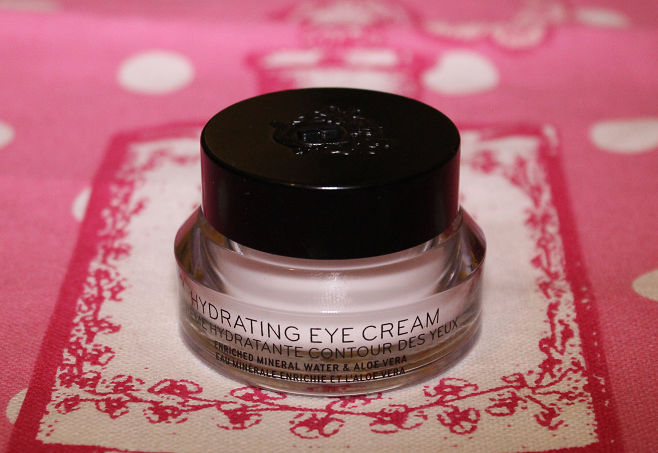 I've also been wearing it under my eyes to cover my dark circles and whilst it does do a fairly good job at covering them, it can take a lot of buffing in around the eyes. My dark circles are pretty bad though and I've heard from others on Twitter that it's great for their dark circles. I like to apply this using the doe foot applicator then I buff it in with the Real Techniques Buffing Brush. The NARS Radiant Cream Compact Foundation is also amazing. I've got the lightest shade which is Siberia and again, this matches my skin tone perfectly. This foundation provides a medium to full coverage and does a great job at covering redness and blemishes. It also makes my skin look very healthy and glowing. Sometimes foundation can be a bit drying on my skin but this doesn't feel like that at all. 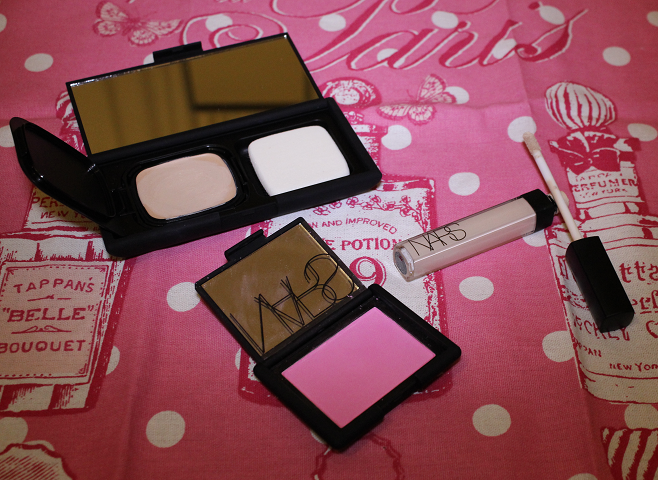 Despite it's great coverage, it feels very light on the skin which is great for those who hate heavy feeling makeup! I've been loving my NARS Blush in the shade 'Gaiety'. It's such a gorgeous blue toned Barbie pink. Don't worry if you're scared of this colour though, it goes on the skin a lot less bright and is very buildable! I'm wearing it in this post if you want to see it on the cheeks. You could wear this during the day or night for a lovely pop of colour on the cheeks so I'm glad I took a chance on this bright shade. I would imagine the Urban Decay Naked 3 palette features in a lot of January Favourites blog posts since it only came out in December. 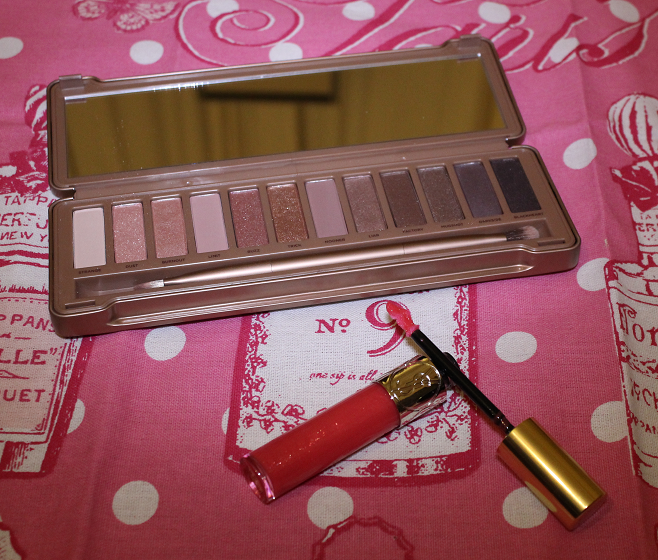 This is my favourite of the three palettes as it has a lot of lighter shades that are suitable for my pale skin tone. I love the range of finishes and shades in this palette. You can do a lot of different make up looks with this so I'll definitely get a lot of use from it. My original Naked palette still gets a lot of love a few years down the line. These are just great quality eyeshadows that blend perfectly. A massive thumbs up from me! It had been a while since I'd been excited about a lipgloss as I've definitely become more of a lipstick girl over the last year but the launch of the YSL Gloss Voluptés really caught my eye! I love YSL for their luxurious lipsticks and packaging anyway but when I swatched these glosses, I fell in love some more. Some of the shades have amazing pigmentation and they are all glossy without being sticky. I love the shade I bought, 15 Grenade Pepite, as it's a beautiful pinky coral shade with shimmer. This is one of the more pigmented ones and I loved wearing this for an easy to maintain bold lip on a night out. I kinda want some more but they are pretty expensive! Well worth the treat though, especially if you have Boots Advantage Points to use like I did. I hope you enjoyed reading about my favourites. 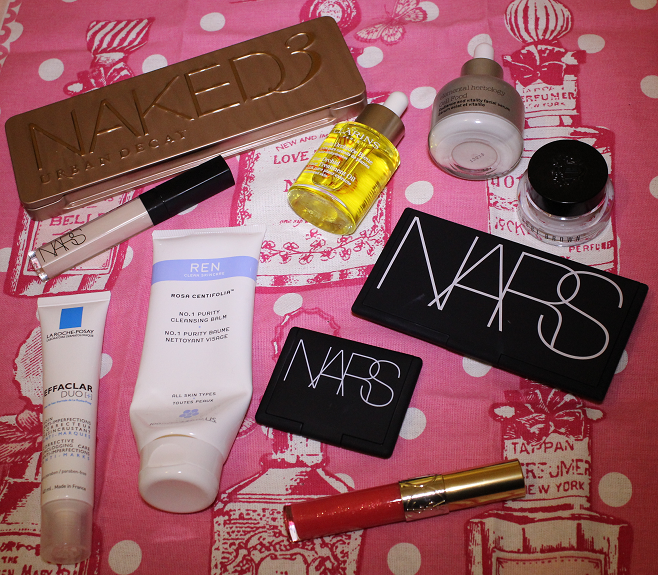 Yep, Naked 3 is in my Jan faves..
That NARS blush is beautiful!